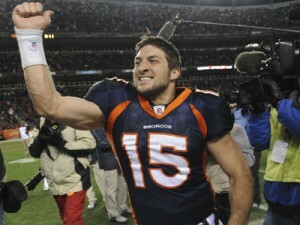 Discussions of Tim Tebow are as polarizing as politics! Folks tend to split on the issue, and in their fighting, move to extremes. And if the debate is a fire, media coverage of Tebow has served as gallons and gallons of fuel poured upon it. What follows here is an attempt to summarize some key issues in the (current) discussion and hopefully to inject some objectivity (or something like that). In case you don’t follow the NFL or haven’t followed American football the past few years (if you do/have, skip to next section), Tim Tebow is a former Heisman-winning, College National Championship winning, uber-popular, outwardly Christian, and now professional quarterback in the National Football League. He is known for being bigger, stronger, and more athletic than most quarterbacks, his toughness, his ability to make plays and win against the odds, and, not least of all, his unorthodox throwing-motion. In his second year in the NFL (2011), he was handed the starting Job of the Denver Broncos, 1-4 (W-L) at the time, and helped lead the team to the playoffs, winning several games in dramatic fashion, and even winning the first playoff game against the Pittsburg Steelers. Most other stories in the NFL that year were drowned out with so-called Tebow-mania. After the season he was traded to a new team, the NY Jets, where he was expected to backup Mark Sanchez at QB, as well as play in certain packages during games. Well, that’s what’s happening with the Jets, though Tebow isn’t playing as much as many expected. Most observers believe he is being poorly utilized by the team (some say keep him on the bench, some say start him). The starting QB, Sanchez, is stinking it up, as is the team who will likely miss the playoffs now with a 3-6 (W-L) record. The Question: Why not start Tebow? 1. The starter, Sanchez, played well enough to help the team make it to the AFC championship game his first two seasons (’09 and ’10). 2. Head Coach Rex Ryan came with Sanchez (or Sanchez with Ryan) those same years–they have a history, and it started well. 3. Rex’s style is one of a dominant defense and a productive running game on offense, so a QB who is good but not necessarily great should be enough to help the team be playoff (and maybe championship) caliber. 4. Sanchez was given a huge contract before this season which guarantees him millions of dollars this season and next–the Jets have a financial motivation to see him succeed. 5. The decision to replace Sanchez likely means giving up on Sanchez as a franchise QB (and looking silly for blowing all that money on him). 6. Tebow is so unlike the typical franchise QB and inexperienced enough at the pro level that it is not obvious he is the long term answer either. 7. Rex Ryan is proud and may see starting Tebow as signaling his giving-in to Media pressure. It seems he’s chosen to die on the Sanchez hill. 8. 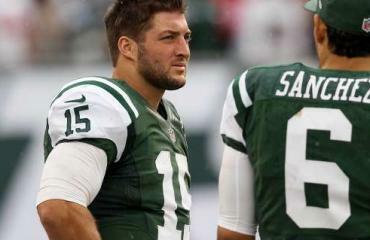 Some have speculated keeping Tebow off the field saves the Jets money if he does end up starting the last few games. (This is due to salary escalators tied to playing time). 9. Management (owner Woody Johnson or GM Mike Tannenbaum) may be exerting some pressure in the situation, too, though it isn’t clear to me what they’re thinking. Disclaimer: I have nothing against Sanchez. Though he’s played poorly this season (an understatement), I’d love to see him turn it around and become an elite QB. But the truth is, in his fourth season as a pro, he is showing few signs of improvement. Some argue it is not his fault–the other players around him are stinking it up, too. No question: the offense as a whole stinks. But Sanchez is himself failing in key areas, in leadership (and so-called “intangibles,”) and in skills. His red-zone turnovers play significantly into falling behind in games, losing momentum, and so on. His actual stats are atrocious this season. He has the lowest completion percentage in NFL, poor turnover to TD ratio, and has exhibited very poor decision-making. In his defense, his first two season (’09 and ’10), Sanchez played incredible in the playoffs, averaging a passer rating in the low to mid 90s, a top-third NFL sort of rating. In 2010 he helped the Jets beat the Patriots (at Gillette stadium) with a completion percentage of 60.6% and passer rating of 127.3. He followed this game up with an excellent performance at Pittsburg although a losing effort. Keep in mind, though, that Sanchez was not that impressive during the ’09 and ’10 regular seasons. The ’09 Jets went 9-7 during the regular season. Sanchez had a passer rating of 63, completed 53.8% of his passes, and threw 20 interceptions. In ’10, the Jets improved to 11-5, and Sanchez improved a little, having a passer rating of 75.3, completing 54.8% of his passes, throwing 13 interceptions. He again turned it on in the playoffs. Last year was more of the same, arguably slight improvements statistically, but continued inconsistency. This year the numbers are back down: passer rating of 70.4, completing 52% of passes, 9 interceptions to 10 TDs. So the question is: Does Mark Sanchez have those ’09 and ’10 playoff performances somewhere in him? Rex Ryan seems to hope so. He’s willing to take a chance on it. If you ask me, Sanchez is starting to demonstrate that those great performances were not signs of things to come. First off, to try to set aside some subjectivity, never mind for a moment Tim Tebow’s off-the-field life, his outward Christian faith, and the media coverage. What we know: Tim Tebow helped the 2011 Denver Broncos turn their season around. He couldn’t have done it without help from the coaches and some talented players. But the Broncos couldn’t have done it without Tebow, either. When you look at the Tebow-time fourth quarter miracles he pulled off, it’s hard to believe. Before looking at the statistics, one thing the 2011 season showed about Tebow was his leadership and competitive drive translated from the college field to the pro field. Statistically Tim Tebow was good, bad and ugly in 2011. His passer rating of 72.9 was not that good (though he and Sanchez share this stat). His completion percentage was the ‘ugly’: 46.5%. Some of the incompletions were uglier. I watched a good many of them. The good? Well, start with wins. While some were ugly, he led his team to a number of wins and that must count for something. The playoff game against Pittsburg can’t be written off, either, just as we shouldn’t forget Sanchez played well in ’09 and ’10 during the playoffs. Tebow only threw 6 interceptions during the season, and while he didn’t throw a lot, he did not turn the ball over as much as many young quarterbacks in their first season (Tebow was in his second season, but his first season as a regular starter). He also ran for 660 yards. Keep in mind most of those rushing yds came after a third of the season was over. Michael Vick rushed for 777 in his second season, and peaked at just over 1,000 yds in 2006 (in 16 games). So most agree that Tebow has certain intangibles, a drive to win, toughness, along with an ability to make plays, run the ball, and even throw certain passes pretty well (e.g., deep seam passes). But many question whether he can ever change his throwing motion and/or improve that completion percentage from two-thirds of a season one year ago. The truth is: we can’t know until he’s given a shot, a couple of seasons to develop on the playing field. Like I said, that poor completion percentage was based on two-thirds of a season in what was effectively his first year as a starting QB. Compare that to a few other QBs’ first seasons as starters: Mark Sanchez 53.8% (’09), Eli Manning 48.2% (in 9 games, ’04), and Michael Vick 44.2% (in 8 games, ’01). Peyton Manning was a bit better than these guys at 56.7% in ’98. Tebow’s longer-than-ideal release is mitigated, I think, by his ability to buy time with his legs. His ability to read defenses is unproven–he needs a couple more seasons like those quarterbacks mentioned before. This doesn’t mean Tebow will be a great quarterback; It means he might be. Sanchez came out of college with similar numbers (passing, not rushing!) as Tebow. Sanchez is looking like a possible bust, as is Vick. Eli Manning is up and down, but mostly up and a two-time Superbowl champion–hard to argue with that. And his big brother, well, you surely know. So pro-Tebow folks need to be patient, and anti-Tebow folks need to take a chill-pill and refrain from making their judgments so quickly. 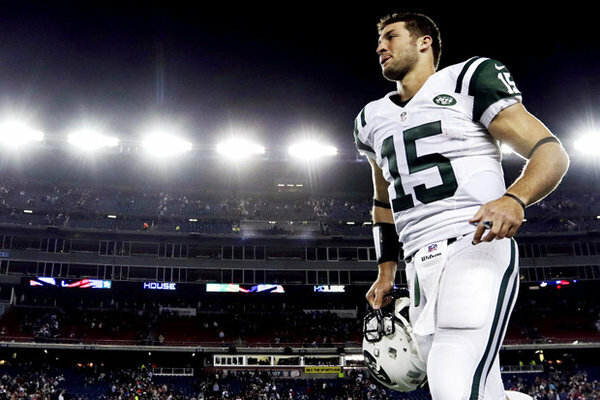 I think Tebow is a better option for the NY Jets than Sanchez given their current situation. But I believe that their situation is very complicated. They have to be absolutely convinced Sanchez isn’t their guy before they bench him given (1) his playoff success in his first two season and (2) the money they’ve promised him. He’s not the kind of confident guy that seems able to bounce back after being benched. Making Tebow a QB is risky, too. What if he doesn’t do well? He’ll be hard to trade for the Jets. And if he does alright? Then they have to decide whether to make him the QB of the future? (And what about that McElroy guy on the bench? When does he get a shot?) Do they want to take the Tebow-risk and give him a season or two to give it a go? Remember, they have an aging defense. A couple of seasons may be too long to wait. Probably the Jets were hoping Sanchez would play well enough to see this defensive unit through a couple of more seasons, and possibly develop McElroy behind Sanchez. Tebow was never intended to take the starting position. I’m a Tebow fan. Since my Kansas City Chiefs are hard to watch this season, I’m watching the Jets. I think Tebow deserves a starting job somewhere, whether or not it’s with the Jets. (I think he’d be better off elsewhere). I’d take him in Kansas City, but I doubt that’ll happen. I think someone will give him a shot, though, and I wouldn’t be surprised if he brings that completion percentage up and shows that he can be a capable QB in the NFL, a maverick of sorts who is will win big games. But at the end of the day, we won’t know until he has a shot. I personally hope he gets it soon.